Captain Stuart Broad believes England's decision to insert New Zealand proved costly in their 55-run defeat in the second Twenty20 international. Brendon McCullum hit a 38-ball 74 as New Zealand made 192-6 before bowling out England for 137 in Hamilton. "We made the wrong decision at the toss, the theory being that on a small ground you can chase virtually anything with wickets in hand," said Broad. "We will learn from this, it was a poor performance all round." England had posted their highest ever T20 score (214-7) in the first match in Auckland, with the Kiwis falling well short on 174-9. However, the roles were reversed in Hamilton as the hosts levelled the three-match series thanks to some powerful batting from Hamish Rutherford (40), Martin Guptill (47) and McCullum. England lost two wickets in the second over of their reply and never recovered, despite Jos Buttler's belligerent 30-ball 54. "It was one knock which took the game away from us - when Brendon McCullum produced some really good hitting on another very small ground," said Broad. "You saw with Jos Buttler that, on these grounds when a good batsman gets in, it's pretty hard to stop them. It has made us realise that if you have wickets in hand at the end you can set or chase pretty much anything. "192-6 is a big score but, with 50-yard boundaries, you are always in the game. However, the stats also say that if you lose three wickets in the first six overs you have a 95% chance of losing." It means England, who also play three one-day internationals and three Test matches on their tour of New Zealand, head into Friday's final T20 match in Wellington with the series nicely-poised at 1-1. 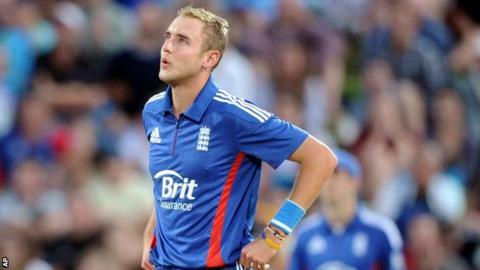 "It will be an exciting third game, both sides will be going hell for leather to win," added Broad. While England were left disappointed with their performance, New Zealand were delighted to bounce back from their hammering in Auckland with such a convincing result. "The other night was disappointing and England blew us off the park," said Black Caps captain McCullum. "I thought we played extremely well tonight - it was a much improved performance. "It's nice to make a contribution, whether captain or not. It was good to play a hand today but so did the other guys and we're very happy with the performance."